"The Sun has a Dark Sister. Long ago, before even great grandmother's time, the two suns danced together in the sky. But the Dark One was jealous that her sister was so much brighter, and in her rage she cursed us for not loving her, and loosed comets upon the world. A terrible winter came, and darkness fell and bitter cold, and almost every living thing perished. After many seasons, the Bright Sister returned to her children, and it was warm and light once more, and life was renewed. But the Dark Sister is not dead. She is only hiding. One day she will return." One view holds that the Sun has a companion star (the red dot- click image right) on a highly eccentric orbit that enters the Oort Cloud around its perihelion, and therefore periodically sends comets cascading in toward the planets. It is said "History repeats itself." We are now in a transitional period from Industrial Civilization to Information Civilization. Cycle or wave rather than simple extrapolation of the present line or trend gives us fertile imagination of changes. By this Nemesis story, we can imagine the longest, 26 million year cycle of change!! May the civilization which can imagine such a longest cycle continue on at least duration of about half of this cycle. Nemesis is one of several names given to our Sun's small companion star. This little star is now about two light years away and moving away. But in another few million years, it will return and head back toward the Earth. The inward trip will take another dozen or so million years, and before the orbit is complete, Nemesis will pass through the Oort Cloud, an envelope of billions of comets that go around the Sun beyond the outer planets. As Nemesis passed through the Oort Cloud, its own gravitational force will deflect some of the comet orbits in random ways. Some will be sent in toward us. As a result, one or more of the errant comets will collide with Earth. And we know from the geological records of Earth history that such collisions can be devastating. One incident killed the dinosaurs and another got the last of trilobites. Many of the major biological crises of our past, the mass extinctions were evidently caused by large-body impact. And because the Nemesis orbit has a period of 26 million year. First, nobody has ever seen Nemesis and there is no direct observational evidence that our Sun has a companion star. The Oort Cloud of comets has never been seen. The demise of the dinosaurs by comet impact is debatable. The 26 million year periodicity in mass extinctions may or may not be real. Are we living on a safe planet or should we have chosen a better one? which provided the space for our mammalian ancestors to evolve and diversify. Humans are probably here now because (among many other factors) of the death of the dinosaurs. In 1908, an extremely small comet fragment exploded over Tunguska in Siberia and knocked down about 6,000 sq.miles of forest. As to the dinosaur's extinction 65 million years ago, the impacting body has been estimated at about 6 miles in diameter. Our atmosphere was so choked with fine debris and water vapor that the entire earth becomes dark. This would prevent photosynthesis and cause the demise of active animals dependent on plants fro food. 3/4 of stars in our galaxy are double or multiple stars. It has been natural to concentrate the SETI search on single stars. But the possibility of a small second star raised the possibility that the evolution of complex life may thrive on (or even require) the adversity of this kind of double-star system. Much of the debate over the Nemesis theory stems from the implications of "catastrophism." What is a catastrophe? It is something sudden and something not predicted in advance. It is big in comparison to what is normal or expected. This is also an element of misfortune. Meteorite is the term given to any rock found on Earth that is of extraterrestrial origin, regardless whether they are comets or asteroids. Comets undoubtedly hit the Earth and make craters, but none has ever been positively identified (except perhaps at Tunguska). The composition of comets is believed as "dirty snowballs" - mainly ice studded with rock fragments. But we have not had specimens to analyze. At present, about 100 impact craters have been authenticated. They range in age up to about two billion years and in size up to 140 km in diameter. proposed that the Permian mass extinction had been cause by a nearby exploding star, a supernova. If the supernova were only ten light years away, the visible and infrared radiation would produce a heat wave lasting many weeks and attendant climatic effect. Also, the atmosphere would be bombarded by high doses of X-rays and ultraviolet radiation. There are historical records of sighting of very distant supernovae: in Europe in 1604 and 1572 and in China in 1054. It has been estimated that a supernova explosion within 100 light years may occur on average every 750 million years. McLaren, Canadian geologist, suggested that the Devonian extinction was an indirect result of an enormous meteorite impact. found at the Cretaceous-Tertiary boundary. Also in 1984, in Australia was found at the top of Devonian sequence. Oxygen isotope ratios in fossils to deduce temperature of the geologic past. He looked at the date of extinction events and the ages of tektites. Tektites are small glassy blobs that are found occasionally in soils and rocks produced by meteorite impact. He interpreted the most boundaries in the geologic time scale are placed at significant extinction points. suggested that the damage of comet impact would be limited to "lethal area" around the impact point. Because many plants and animals are naturally restricted to a single area or region. This provinciality might make it easier to produce a mass extinction of the type we see in the fossil record. The averages fall within a surprisingly narrow range: from about 1-10 million years. 40 million species are alive today. Species living today are only less than 1% of the total number that ever lived. Extinction are not uniformly distributed in geologic time. Some intervals, which we now call "mass extinctions." There are two kinds of species origination. One is the "origin of species" that Darwin talked about: simple change in a single evolutionary line over time by natural selection. If this change is substantial enough, the descendant is a new species. The other is when a lineage of a species branches or buds to form another, coexisting species. The branching process of speciation has been the subject of an enormous amount of research in evolutionary biology in recent years. The number of species extinctions has probably been about the same as the number of speciation events. Two processes - origination and extinction - that are as different as birth and death but that have remained in reasonable balance. "Species go extinct when the size of the breeding population approaches zero", or "Species die out because they can no longer cope." But the dinosaurs had been doing very well for 140 million years and then, over a fairly short time, they died out completely. The mammals had been coexisting with dinosaurs for upwards of the 140 million years. Dinosaurs did not rule the Earth any more than lions today rule the Earth. At their acme, dinosaurs had as few as 50 species living at any one time. There are about 5,000 species of mammals living today and about an equal number of reptiles. (In Mesozoic more reptiles and fewer mammals) Dinosaurs were a minor part of the biology of Mesozoic era. Earth was in a cooling phase during the late Cretaceous, and dinosaurs were generally confined to the warmer regions. Also the number of species of dinosaurs did decline: as few as 25 coexisting near the end. Marine sedimentary sequence is more complete in fossilization, which indicate severe extinctions near the end of Cretaceous. Out of 790 families of marine animals 120 (15% ) were extinct by the end of Cretaceous. The figure for the taxonomic level of genus is approximately 50%. We tend to think of mammals as survivors, but may mammalian groups were hard hit and lost most of their species. The marsupial mammals suffered profound losses and nearly died out. In any event, the best available estimates are that between 60-80% of marine species died out. This is not quite as high as 96% estimate for the Permian mass extinction. On the survivors' side, reef corals themselves got through the crisis pretty well, as did most deep-sea animals. Future research to identify the winners and losers, so that we have a better chance of learning what environmental stresses were responsible for the disaster. Pleistocene extinction event: (7,000 -10,000 BC) Mammoths, mastodons, horses, camels, sloths, sabertooths, and other large animals once thrived in North America died out in a rather short interval. The kill rate was about 70%. But the killing was almost completely restricted to large, terrestrial mammals. The timing is about right for the migration of early man from Asia to North America, also hunting sites have been found. This may have been the first man-made extinction. Iridium is normally almost absent from the Earth's crust, but relatively common in meteorites. by Luis and Walter Alvarez, etc. A large asteroid hit the Earth 65 million years ago and force of impact sent up into the atmosphere about 60 times the asteroid's volume in pulverized rock and fragments of the asteroid itself (with is iridium). The atmosphere became so clogged with dust that sunlight was blocked and photosynthesis was inhibited. This, in turn, broke down food chains and led to the demise of animals dependent on plants for food. The size of the impacting asteroid was estimated from the amount of iridium. The diameter of the body was 10 plus or minus 4 km. Karl Turekian of Yale in 1981 presented a paper: Osmium is another of the platinum-group elements that is commonly present in meteorites but extremely rare in ordinary rocks of the earth crust. Furthermore, the ratios of the isotopes of osmium differ substantially between the crust and meteorites. The paper reported osmium isotope ratios much closer to those of meteorites than the crust, and concluded with a strong statement of support for impact at K-T boundary. In fact, minor difference in osmium isotope ratios among the several sample suggest that there might have been more than one impact. Two separate minerals called stishovite and coesite, both form of quarts, are often associated with the shock metamorphism. Bruce Bohor at USGS reported finding shocked quartz at K-T boundary sites both in Europe and North America. This was impressive, because the shocked quartz is a tried-and-true indicator of impact. Smaller glassy particles called microtektites have been found in some sedimentary rocks, and these are interpreted to be byproducts of meteorite impacts. They found tiny spherules as altered microtektites. There remains much argument over whether the spherules were originally microtektites. The K-T anomaly had been found around the world and in virtually all kinds of sedimentary environments, from the deep sea to swamp deposits on the continents. Scientific questions ought not to be settled by popular vote, but the opinions of groups have an enormous influence on the course of scientific research. 12%: There was neither mass extinction nor K-T impact. In 1977, Alfred G. Fischer and Michael A. Arthur published a paper titled "Secular Variations in the Pelagic realm", claiming that the major extinctions of the past 250 million years were evenly spaced, coming every 32 million years. This was anathema! We all knew that the history of the Earth was too complex to be amenable to such a simplistic description. What would keep the system on time? In spring of 1983, John Sepkoski, Jr, a paleontologist and the author published that the extinctions seemed to be regularly spaced in time. Draw a card from an ordinary deck of cards every morning for 250 days. If the card is a black ace, we put an X on a calendar for that day. The card is replaced and the deck shuffled for the next day. At the end of the 250 days, there will be a scattering of X's, but how will they be spaced? On the average, the X's should occur every 26 days (the chances are 2/52) How these experimental distributions really look like? The results are completely typical of points arrayed on a line at random. Rather than a waiting time of about 26 days between black aces, we find that most gaps are smaller. A few long gaps are balance against a lot of short ones to produce the average of 26. The below red dots show the most probable positions in time of the 8 statistically significant extinctions. The horizontal black bars show the worst case uncertainty. Each of the events has been assigned a "cycle number" following the hypothesis that the events are exactly 26 myr apart. The blue straight line defines a perfect fit to the 26 myr periodicity. Two events, numbered 5 and 7 are missing from the record: either they did not occur or they have not been found. The most recent 4 events are the best dated and fit the hypothesis. The K-T events is the third one. The Galaxy is disk-shaped. As it rotates in space, our Sun and its planets move slowly up and down the galactic plane. Solar system to complete a full cycle of movement between 62-67 million years. The Sun crossed the galactic plane twice in each complete oscillation every 31-33 million years. Our sun is currently very close to the galactic plane, yet the most recent extinction was 11-12 million years ago. It suggests that we are now about midway between two events, which should put us near the maximum distance from the galactic plane! 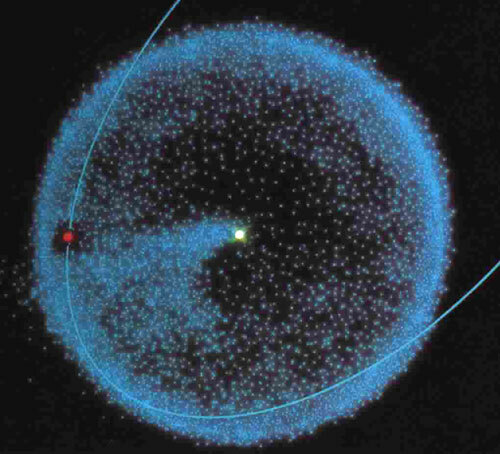 A small solar companion on a highly eccentric orbit - an orbit that carries the companion through the Oort Cloud once per revolution about the Sun. Accidental disturbance of comet orbits in the Oort Cloud then produces a comet shower on earth and the comet impacts, causing mass extinction. The companion star must be very small less than a tenth of the Sun, and positioned now about two light years from Earth. If there is a companion star, why have we not seen it? The companion would be by far the closed star to the Earth, about half the distance to the next closest, Proxima Centauri. In Jan. 1985, D.P. Whitmire and J.J. Matese suggested that the comet showers could also be produced by an unseen tenth planet, Planet-X, lying beyond the orbit of Pluto. Long-term changes in climate are the major cause. If there is uncertainty in the observation data, any conclusions based on them will be uncertain. This is true in some things, but not with the kind of statistical testing. One rather curious objection to the Nemesis idea is that a wobble in the orbit would cause an average of 10% variation in the length of the period. It is too perfect to be explained by Nemesis. "The discovery by University of Chicago paleontologists David Raup and J. John Sepkoski Jr. at first sounds like a vaudeville joke: The bad new is: The end is coming. The good news is; It's 13 million years away.... We always thought of the dinosaur as dumb and deserving to be extinct. Not true. Dinosaurs, it turns out, were merely victims of circumstances. Certain life-forms are subject to mass extinction, and this happens roughly every 26 million years. A new life-form then arises. This caused quite a stir among other scientists to figure out why...."